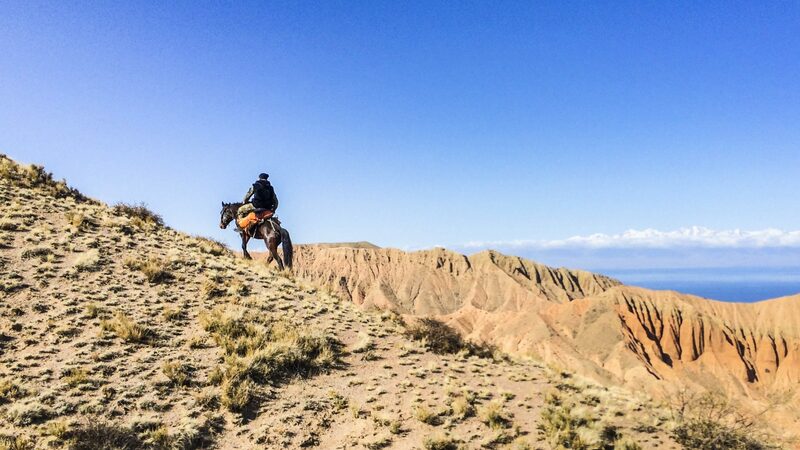 As writer Erik Trinidad discovers, the jaw-dropping landscape of mountainous northern Kyrgyzstan served as the perfect backdrop for a bit of horseback trekking and culture swapping with the locals. On the southern lakeshore of Issyk-Köl, within the Ala-Too mountains of northern Kyrgyzstan, rhythmic music filled the air, as far as a small cell phone speaker could reach. The melodies sounded Arabian to me, but I wasn’t familiar with the lyrics. “Is that Kyrgyz?” I asked my local guide Baha in simple English. “Ya. Kyrgyz,” he replied. It was one of the four songs he had on his phone—according to the count I had in my head before the loop would start over—that we’d heard over and over everyday during our horseback riding excursion. Excited to have American songs readily available—songs he might have heard on television or radio—the young Kyrgyz man took my phone and tinkered around. Before I knew it, we were riding horses with the snowy peaks of the Küngöy Ala-Toos in the distance, listening to Tammi Terrell and Marvin Gaye’s rendition of “Ain’t No Mountain High Enough”—a perfectly fitting tune. I couldn’t help but smile, not only at the irony, but at Baha’s excited face as he swiped through my eclectic MP3 library. 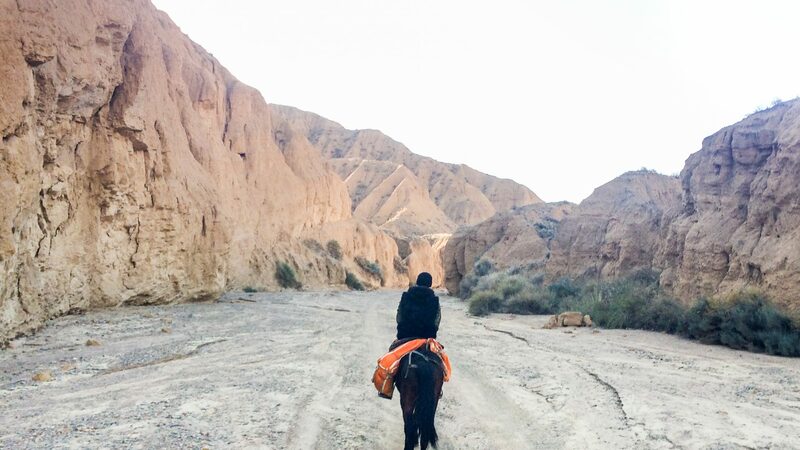 However, perhaps he got a little too caught up in looking down at my smartphone, because soon his horse was about to lead us off the edge of a small canyon. “Baha!” I alerted him. Fortunately, we turned away from the gully in time. Needless to say, I asked for my phone back. 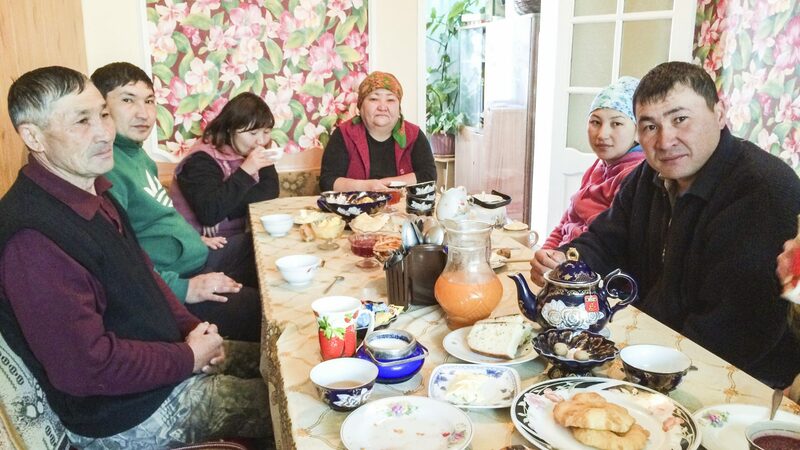 While modern music-playing technology is ubiquitous in many parts of the world—even in developing nations—it is still a novelty in this remote part of Central Asia, amidst the rural villages around Kyrgyzstan’s largest lake. Issyk-Köl (köl, Kyrgyz for “lake”) is the second largest alpine lake in the world after Titicaca in South America, and is one of the major draws for tourism in the country. 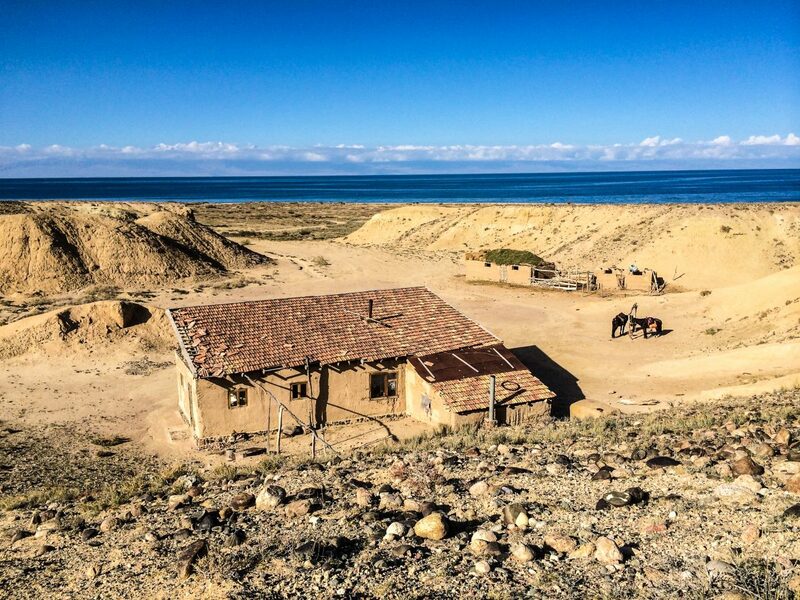 While the northern shore is littered with resort towns targeting beach-going tourists from capital city Bishkek—as well as visiting Russians and Kazahkstanis—the undeveloped southern shore attracts a different type of traveler. 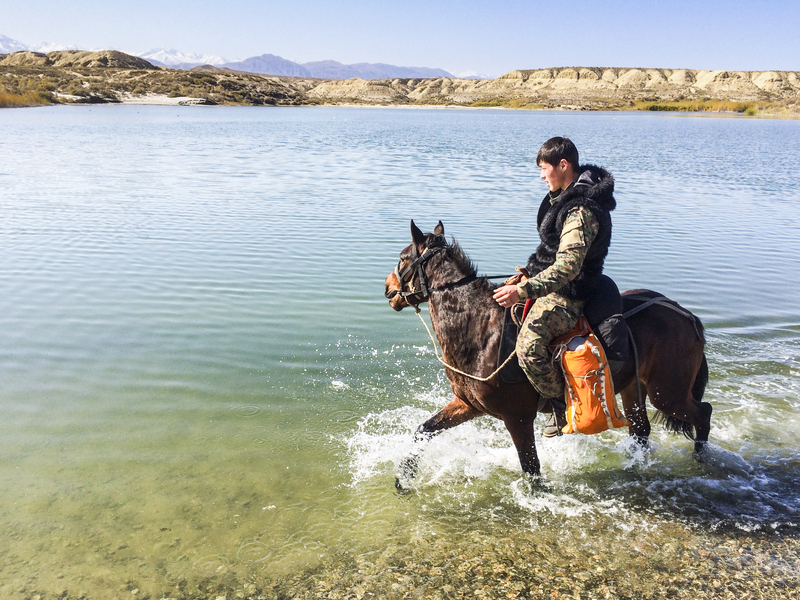 Here, outdoorsy types flock to Karakol, base town for trekking the nearby Tian Shan Mountains, or to villages like Bokonbayev for rugged horseback riding experiences with the locals. 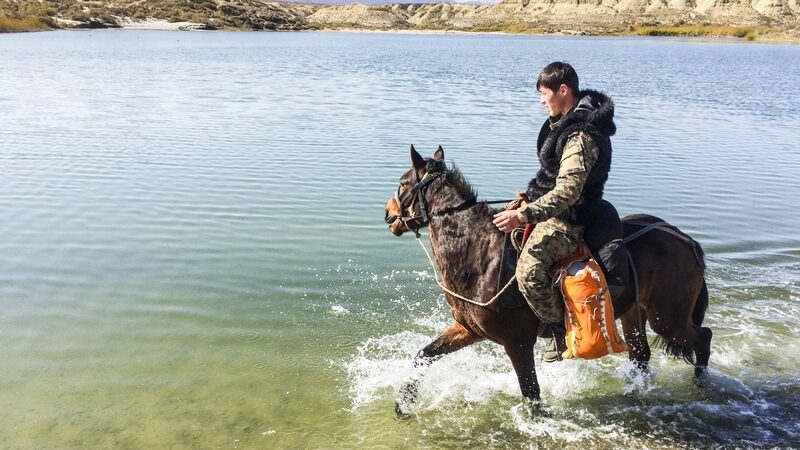 Interested in the latter, I had arranged an excursion with Iron Horse Nomads, who had organized horses and homestays with the local Kyrgyz Community Based Tourism Association. It was through them that I was connected to Baha, whose family ran a secluded horse ranch in Jaichy. Our limited abilities to have a real conversation didn’t tarnish the experience for me; the dumbfounding countryside of rock and water left me conveniently speechless. “Jaqshë?” Baha asked me, to see how I was doing. English was not a language he was accustomed to speaking; mostly he spoke his native Kyrgyz and a little Russian. “Jaqshë,” I replied with my thumb up, to acknowledge things were okay. Sure, I had a little saddle sore—that was expected—but describing my minor pain to him would have been too difficult to do. Most of our communications were simple exchanges in broken basic English. Our limited abilities to have a real conversation didn’t tarnish the experience for me; the dumbfounding countryside of rock and water left me conveniently speechless. Looking outwards from atop a mountain pass, the cerulean hues of Issyk-Köl reflected a cloudless sky, and it might have been a perfect mirror if not for jagged, rocky horizon in between, or the stucco-like texture coming from the slight chop on the giant lake’s surface. In the distance to the north, the taller, white-capped members of the Küngöy Ala-Too family peeked their heads above a misty shroud. Despite these ethereal sights, what was physically happening beneath my eyeline was absolute bedlam. Riding over a pass of the dusty, southern Terksey Ala-Too range proved to be unlike any horseback riding excursion I’ve been on before. 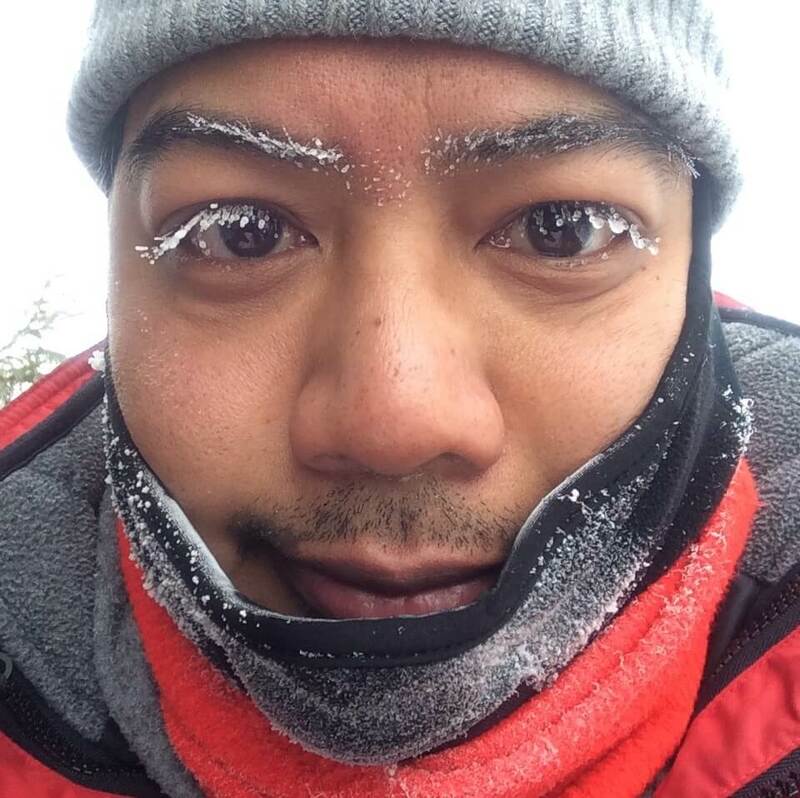 Without designated trails—or any trodden path at all—the trail was extremely rough, and completely out of my comfort zone. 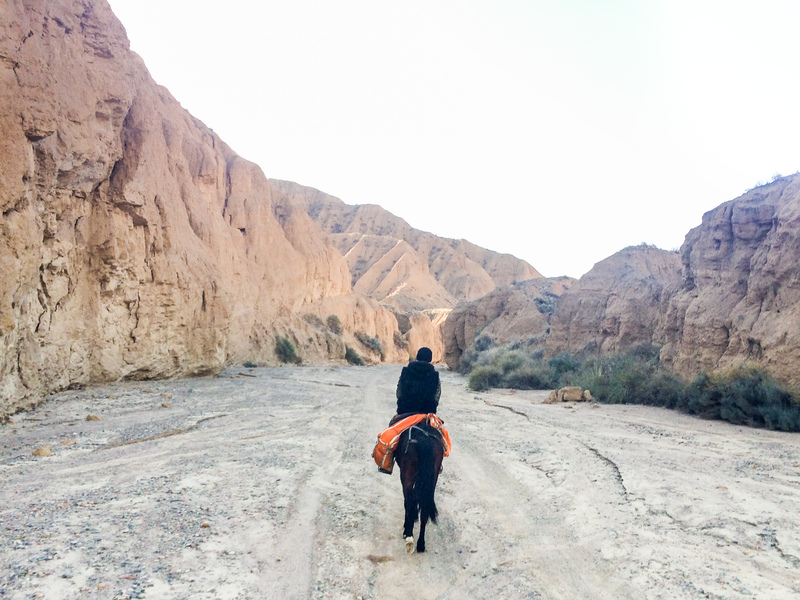 But cautiously, Baha and his horse fearlessly led the way, especially in areas where we’d ride steep, narrow ridges with imminent drops mere inches away—and sometimes on loose terrain that you wouldn’t dare hike on foot, let alone go by horseback. Fortunately for me, my questionably capable horse was actually skilled on all fours with a great sense of balance, even after each occasional slip. Ultimately we survived riding across the pass to Kyzyl-Tuu, a village where we were greeted by one of our homestay hosts. 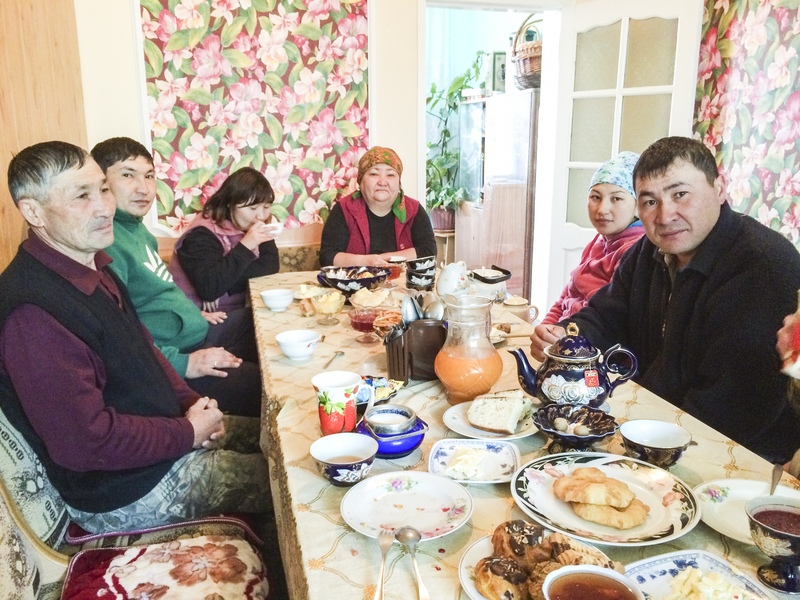 A friendly Kyrgyz man named Rustom who spoke decent English took us weary horsemen into his suburban-like home at the center of his farm, where his smiling wife Gula served us her rendition of kurdak, a home-cooked stew of mutton, potatoes, veg, and barley. We were joined by other members of the Abdekaparulus family, and our meal was sprinkled with friendly, albeit simple conversation. We finished off with sweets, including dried fruits and lavz, a local bite-sized pastry. “Kyrgyz Snickers!” Gula joked. 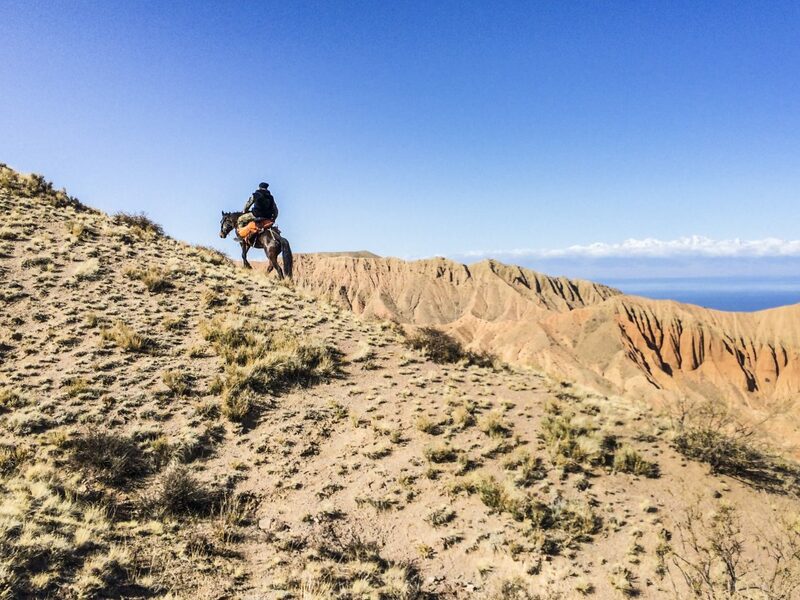 “Chong Rahmat!” I called out from my horse, thanking our hosts in Kyrgyz as we bid them farewell the next morning. Baha led me away from the permanent home, towards the prairies between the mountains and the lake, where his nomadic ancestors dwelled in yurts before community tourism existed. 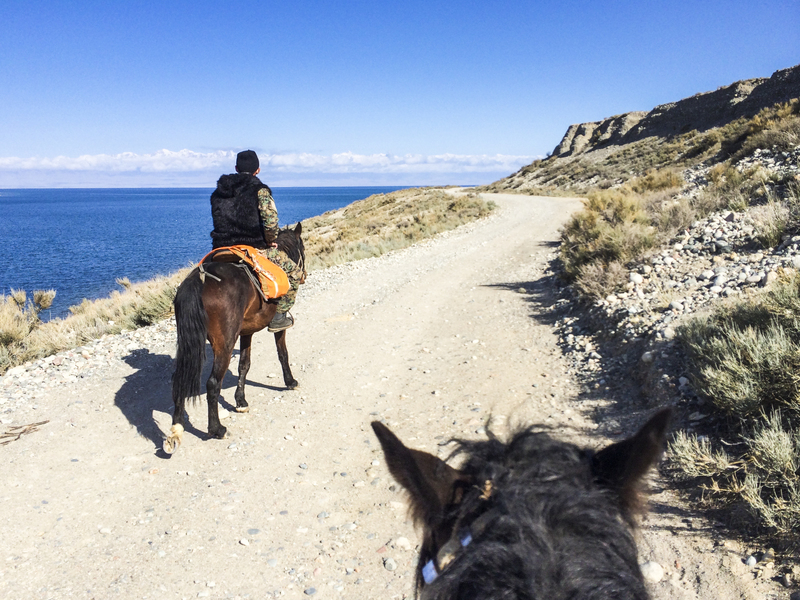 His cell phone’s tunes set the mood again as we rode the horses on the flatter trails of Issyk-Köl’s shoreline. 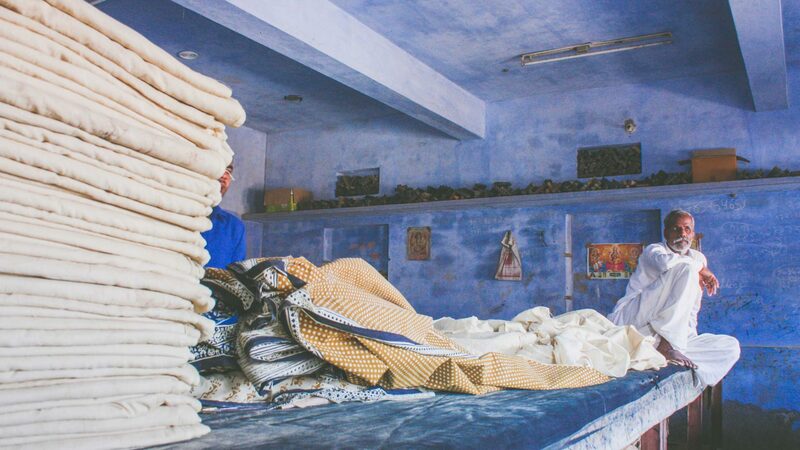 Other homestays along the way provided local shelter and food for Baha and me—as well as for our horses—but it wasn’t until we arrived back at Baha’s home in Jaichy that I felt especially connected to his people. Baha’s mother prepared a meal for us, while Baha and I continued to communicate in broken English and with more exchanges of “Jaqshë” as both a question and response. It might have been the usual conversation, until Baha picked up his komuz—a Kyrgyz instrument similar to a guitar—and started playing for me. Unlike the polished Kyrgyz tunes from his cell phone—or the Motown coming from mine—his random strumming wasn’t melodious at all, and I ascertained that he wasn’t as talented a musician as he was a horseman. 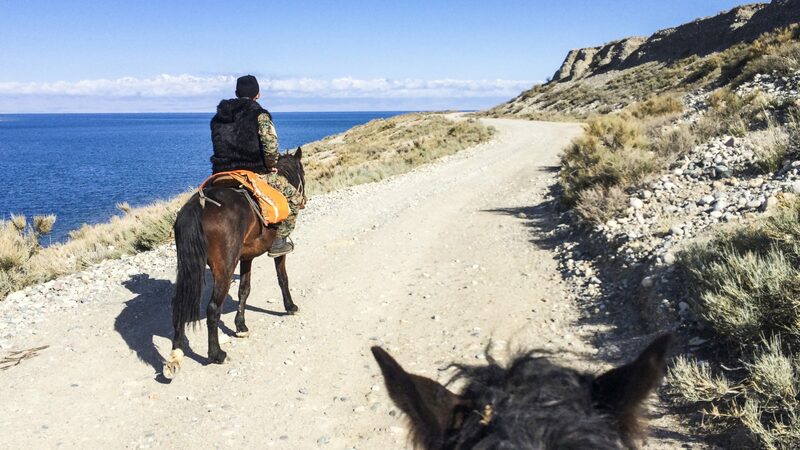 Young men like him, whether they are guiding adventure tourists or not, are truly in their element when riding the mountains around Issyk-Köl—and from my experience with Baha, I knew that at least for him, there definitely ain’t no mountain high enough. With over a dozen regional bureaus—including Bokonbayev, Karakol, Kochkor, and capital Bishkek—Community Based Tourism (CBT) in Kyrgyzstan is an easy and accessible network of guides to help travelers experience the rural areas of the country, while helping support the people who live there. 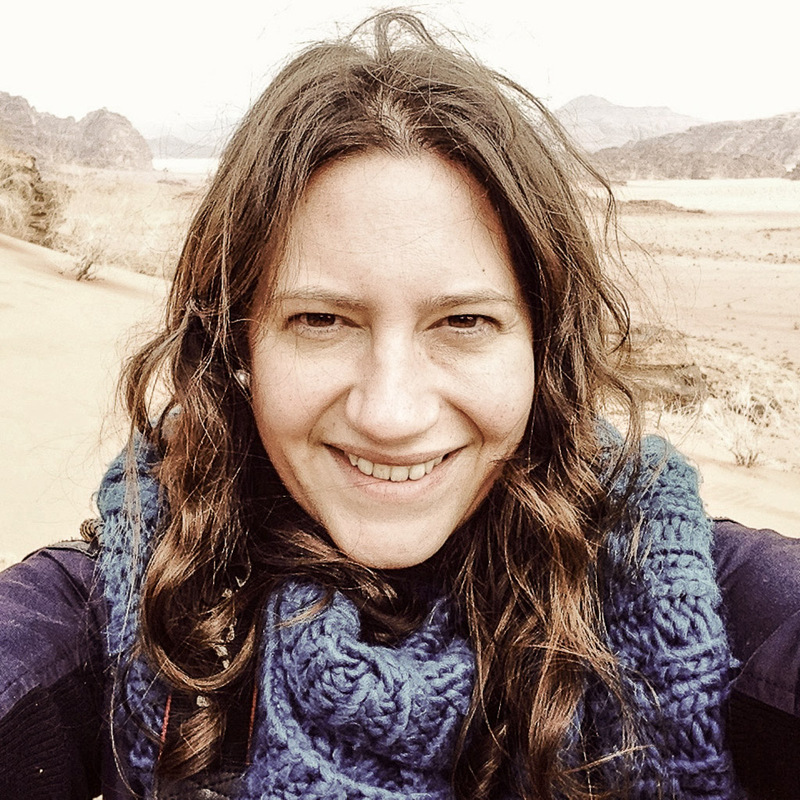 They can arrange horseback riding tours, bike tours, and trekking tours, in addition to homestays and yurt camping (season permitting). Other local tour agencies, who sometimes work with CBT, include Iron Horse Nomads, Top Asia, Ecotour, and Nomadic Kyrgyzstan.